Resplendent in a Chinese silver robe, a jubilant Lang Lang and 5-year-old Li Muzi provided the musical transition of the opening ceremony performances from a celebration of ancient China to the modern era last night. Playing a piece composed by Chinese musician Ye Xiaogang, the duet was accompanied by the China Philharmonic Orchestra under the baton of Yu Long. 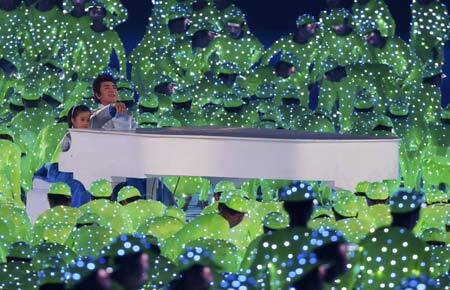 On Wednesday morning, the 26-year-old world-renowned Chinese pianist participated in the torch relay. As he was running along Chang'an Avenue, he delighted cheering onlookers by holding the torch in one hand and mimicking playing the piano with the other. "I am so honored and excited to join the torch relay in Beijing and have been practicing by holding something similar to the torch in size," Lang Lang told China Daily. On August 19, Lang will participate in another event in celebration of the Beijing Olympics at the National Center for the Performing Arts. Billed as "A Night For Piano in China" he will perform with nine other pianists: Claude Frank and Vladimir Feltsman from the United States, Philippe Entremont and Cyprien Katsaris from France, Louis Lortie from Canada, Guillermo Gonzalez from Spain, and Chen Sa, Liu Shikun and Qin Yunyi from China. They will play Jubilant China composed by Chinese Cui Shiguang to mark the Beijing Olympic Games. "It will be great fun to share the stage with 10 pianos," Lang said. "I did it once a few years ago in Switzerland. There were 10 of us and we made thunderous music. I hope this time we can rehearse together before the concert." Despite his busy worldwide performing schedule, Lang Lang is taking some time off to stay in Beijing to enjoy the Olympic games. He's looking forward to watching ping pong, gymnastics, diving, basketball and the 110m hurdles featuring Liu Xiang. The pianist has also been invited to introduce Chinese culture and the Beijing Games on ZDF German Television, one of Europe's largest broadcasters. "I will work as a guest host to do some programs specializing in the Games," he said. "As a Chinese, I feel it is my duty and an honor to promote Chinese culture around the world."